BUFFALO, N.Y. -- The University at Buffalo women's basketball team (1-0, 0-0 MAC) will honor their historic 2017-18 campaign and team on Wednesday night prior to taking on the Niagara Purple Eagles inside Alumni Arena at 7:00 pm. The Bulls will be unveiling their 2018 Sweet 16 banner inside Alumni Arena prior to tip against the Purple Eagles. 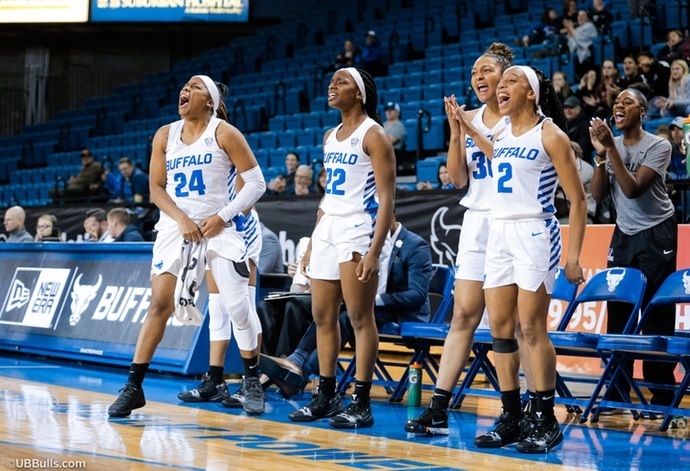 • The University at Buffalo women's basketball team will look for their fourth straight 2-0 start to the season on Wednesday night as they welcome Big 4 foe Niagara to Alumni Arena at 7:00 pm. • Prior to the game on Wednesday night, the Bulls will honor their historic 2017-18 campaign with the unveiling of a Sweet 16 banner inside Alumni Arena. • The Bulls opened up their 2018-19 campaign with a 69-63 road win over Maryland Eastern Shore on Sunday night as they have now won four straight season openers under head coach Felisha Legette-Jack. • Senior shooting guard Cierra Dillard was named to the 2019 Citizen Naismith Trophy Watch list on Monday, awarded to the National Player of the Year. She was the only mid-major player on the list. • The University at Buffalo women's basketball team opened up their 2018-19 campaign on Sunday on the winning side as they were able to go to Maryland Eastern Shore and escape with the 69-63 victory. • The Bulls weren't as sharp as they would have liked to be but they were still able to come away with the road victory, claiming their fourth straight season opening win in the process. • Leading the way offensively for the Bulls on Sunday was senior guard Cierra Dillard who was able to net a game-high 23 points, four rebounds and four assists while connecting on a career-best 13 free throws. • The Buffalo defense had a strong showing against the Hawks as they were able to limit the home team to just 39.6% shooting while causing 23 turnovers and turning those into 28 points. • The Niagara Purple Eagles enter Wednesday nights non-conference showdown against UB with a 0-2 record. • The Purple Eagles opened up their 2018-19 campaign with a loss to Big 4 foe St. Bonaventure before falling 95-35 last time out against Big 12 opponent Iowa State. • As a team, Niagara is being outscored 85.5 to 41.5 so far this season while only shooting 28.2% from the floor and 19.5% from behind the arc. • The Purple Eagles have been hindered by slow starts through two games this season as they are being outscored 48-11 in the first quarter and 46-16 in the second quarter. • Niagara is led offensively by Jai Moore who is averaging 11.5 points, 2.5 rebounds and 1.0 steals while playing an average of 24.5 minutes/game through two games. • Senior Maggie McIntyre is enjoying a nice start to her season as she is averaging 10.0 points and 3.0 assists while connecting on a team-high four triples so far this season. • The Purple Eagles handed Buffalo one of their six losses a season ago in Niagara, downing the Bulls 75-62. • Senior Cierra Dillard was named to the Citizen Naismith Trophy Watch List on Monday afternoon. She is one of 50 players on the list and the only mid-major player to earn a spot. • One of the goals for head coach Felisha Legette-Jack when she arrived at Buffalo was to turn Alumni Arena into a tough place to play, and she is seeing her vision come to fruition. • Since Coach Jack took over the program six seasons ago, the Bulls own a 57-26 record in front of their home fans inside Alumni Arena. • The Bulls had their most successful home season in school history last season as they went a perfect 12-0 on their home court. UB outscored their opponents by an average of 19.5 points/game inside Alumni Arena last season while forcing an average of 21.3 turnovers/game and holding opponents to just 35.2% shooting from the floor and 24.1% from three-point range. • UB has claimed 13 straight victories at home dating back to 2016-17. • The Bulls have won three straight home openers inside Alumni Arena by an average of 15.0 points/game while allowing just 52.7 points/game against during the stretch. • Senior Cierra Dillard is in her final season in a Buffalo uniform and has accumulated 1,372 career points across her stops with UMass and the Bulls. She finished off her first season in a UB jersey leading the squad with 566 points which ranked fourth in school history for points in a single season. • Senior sharpshooter Courtney Wilkins will be relied on heavily this season to step up and score the ball on a more consistent basis and she definitely did that in the season opening win at Maryland Eastern Shore. • The fifth-year player out of Australia earned the start on Sunday and she responded with 15 points and two rebounds across 36 minutes of work. Wilkins connected on 5-of-5 shots from the field and 4-for-8 from behind the arc as she was the teams second leading scorer in the win. • Freshman post Adebola Adeyeye was the lone first year player to earn the start in the Bulls season opener as she finished with two points while playing 11 minutes in her first career collegiate appearance. • Memphis transfer Finess Dickson made a strong impact off the Buffalo bench on Sunday as she played 19 minutes and finished with four points, an assist and a steal while maning the point guard position. • Guard Oceane Kounkou made the most of her limited minutes off the bench on Sunday as she went 2-for-2 from the floor and finished with four points while Keowa Walters grabbed two rebounds and Alexis Adams notched a block off the bench in their Buffalo debuts. • Seniors Ayoleka Sodade and Brittany Morrison have made a major impact on the Buffalo program since they arrived in 2015 as they have combined for 72 wins over their career's including two NCAA Tournament appearances and advancing to the MAC semifinals in each of the past three seasons. • Redshirt senior Courtney WIlkins has been around for the most wins on the roster as she has seen 91 Buffalo victories since joining the Bulls prior to the 2014-15 campaign.